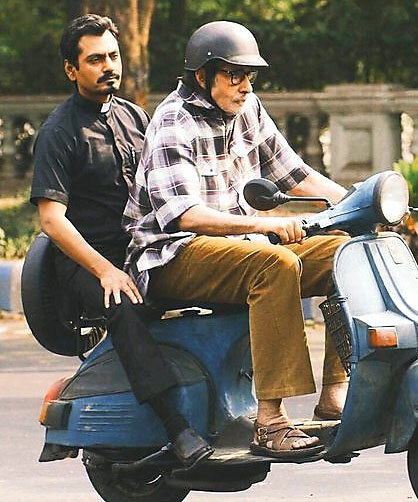 REVIEW: TE3N FALLS SHORT OF BEING A SATISFYING SUSPENSE! In its preoccupation to collect details, Te3n flounders on motive, says Sukanya Verma. At what pace a story wants to unravel is entirely the storyteller's prerogative -- some narratives speak in poetic pauses and cryptic musings; others succeed on a throbbing tempo. In Ribhu Dasgupta's Te3n, the leisurely movement isn't so much to examine the scene of a crime as it is to document the accumulation of evidence. It would be effective too if the film wasn't so willfully minimising its drama and dynamism to conceal the obvious. In its preoccupation to collect details, it flounders on motive. The upshot is regrettably dull, staggeringly questionable and falls short of a satisfying suspense. I had the same issues with its dreary source, Montage, another South Korean thriller involving an abducted minor following Seven Days (Jazbaa) and The Man From Nowhere (Rocky Handsome), of which Te3n is an official and occasionally superior remake. The talent involved -- Amitabh Bachchan, Vidya Balan, Nawazuddin Siddiqui -- do their best to elevate what's on paper whilst Dasgupta's opaque play of timelines injects momentary butterflies into the proceedings. Unlike Te3n producer Sujoy Ghosh's Kahaani, which accesses Kolkata's culture, quirks and flavours to mirror the inner chaos of, and drama surrounding, his leading protagonist, the imagery here, well shot as it may be by Tushar Kanti Ray, replete with mandatory festivals and landmarks, is purely for effect. Also, there's something unnaturally meticulous about Bachchan's overdesigned abode or the ones he breaks into. In his tweaked take on the original, Dasgupta throws in some new characters and addresses different repercussions of guilt -- one that afflicts Nawaz so much, he gives up his cop uniform to slip into a clergyman's. Terrific as he is, he cannot hide his own incredulity over said move and the embarrassment only amplifies every time he's made to crack a stupid joke. But there are moments where Nawaz overcomes the sketchy characterisation -- like that immediate impulse to pull out handcuffs from his uniform's back pocket reveals the police officer never left his subconscious. As his former colleague, Vidya Balan is in sublime form. There's tremendous objectivity in the manner she approaches her role as a cop in charge of solving a kidnapping case that is suspiciously similar to the one Nawaz handled, nearly a decade ago, while Bachchan's hapless victim endured. At the centre of this sentimental mystery -- high on loopholes and unusually cooperative kids (considering the circumstances) -- is AB's heartbroken grandfather dedicated to seeking justice for his deceased grandchild. I didn't instantly warm up to his furiously contorted face and arched posture, too mannered, too mindful. It's only when his quest for the truth intensifies that Bachchan loosens up and provides Te3n its long due breakthrough and the viewer some grasp of his involvement. Even if it comes at the cost of Dasgupta reducing his co-stars to significant sidekicks, neglecting strained ties with his one-scene son and writing his better half (played by a feeble Padmavati Rao) as an indifferent, unsympathetic woman oblivious to the emotion of loss since the sole purpose is to stress on Bachchan as champion. That is no suspense. Neither is this movie.